One of the few benefits of a lengthy commute is the time it provides for reading and podcasts. It can be hard to make time for these things and, unexpectedly perhaps, I've come to cherish the two 43 minute pockets of time each day without WiFi or cellular signal. With email, WhatsApp and Instagram immobilised, I can truly loose myself in someone else's world. Desert Island Discs is a bit of an institution in my Mum's kitchen, and perhaps it's this familiar sense of home that prompts me to download and listen to Kirsty Young's latest castaway each week. A few weeks ago it was the turn of Yotam Ottolenghi, who I'm sure needs little introduction. Hearing Ottolenghi dissect his love affair with the food that has shaped him reminded me just how easy it is to allow the special to become mundane. When we cook with ingredients every day, it can be easy to forgot that they should be appreciated, celebrated and cherished. Ottolenghi is not guilty of this. He still speaks of his everyday ingredients with utter reverence and respect. Perhaps that is why his everyday ingredients - tahini, za'atar and preserved lemons - have become common fair to many of us too. Indeed, I think it is only the true food lover who would chose a lemon tree as their single luxury item on that deserted desert island. Second only to hummus on Ottolenghi's ingredient list is pomegranate. He maintains that they enhance almost every dish, and uses a genius sprinkling of seeds to enliven anything from slow-cooked lamb to a delicate rose-scented milk pudding. 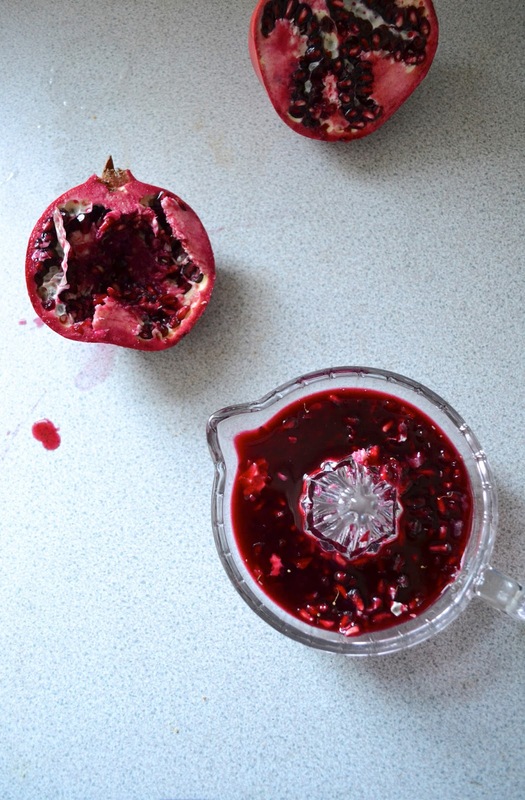 Pomegranates ooze luxury, fertility and indulgence - and, as I discovered when making this recipe, juice! 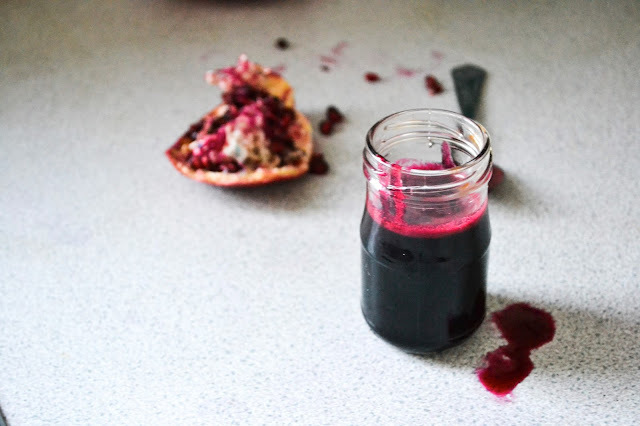 The dramatic pool of blood red juice that seeps from a freshly sliced fruit can be preserved into a fruit molasses, which in turn can be used in a plethora of sweet and savoury recipes. It is very easy to make, and will keep for around six months in the fridge. Begin with the pomegranates. The best way to juice them is to extract all of the seeds, and to place these in a blender or food processor. Pulse, then strain the pulp through a sieve. 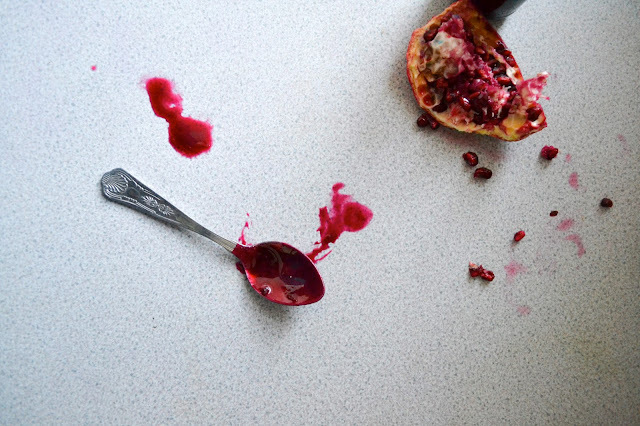 Measure the pomegranate juice, sugar and the juice of the lemons into a saucepan. Set this over a low heat, and allow the mixture to simmer until it has reduced to a syrup (this may take 30 minutes - an hour). Once the mixture is silky and syrupy, pour it into a sterilised jar or bottle.